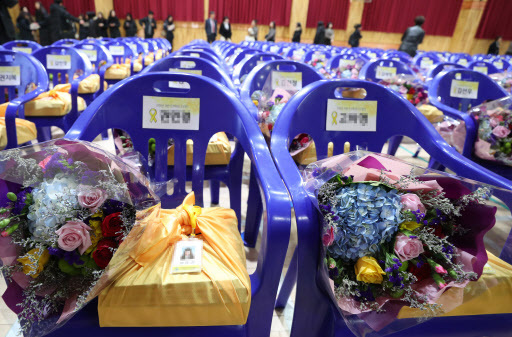 A long-delayed commencement ceremony was held Tuesday for 250 Danwon High School students who died in the Sewol ferry disaster on April 16, 2014. The students were on a school trip to Jeju Island when the ferry carrying 476 passengers sank off the southwestern coast near Jindo, killing 304 aboard. Only 75 students survived, and they graduated in 2016. The victims’ families had asked the school to postpone the honorary commencement ceremony until all the bodies of the victims had been recovered. The bodies of two students -- Nam Hyun-chul and Park Yeong-in -- and a teacher, Yang Seung-jin, have not been recovered. “Nothing can be a consolation or comfort to us other than the children coming back alive,” said Yoo Kyung-keun, head of an association of the victims’ families. The bereaved families had asked for the ceremony to honor students whose names had once been removed from the school register. In the wake of protest from the families, the students’ names were reinstated so that they could graduate posthumously.